Behold, the mighty "S"!!! It's a bird, it's a plane, IT'S A CZ!!!! Some seriously wonderful people conspired to make my wife get a very nice late Christmas present. She is very happy. The grip is long enough that I can get enough of a hold with the pinky to keep it in hand, but just barely. The new mag release is smooth as silk. The slide release is STIFF...very stiff, but it will work in, in time, and I'm teaching her the over-the-top slide release method they teach me every year. The sights are that new and interesting big orange front and blacked out rear. I am told it's a visual cue for the 3 yard rule - inside 3 yards put the orange dot center mass and fire. The trigger isn't quite as nice s the P-10Cs, but I think that's just because it's brand new, again, some work will smooth that out. Re: Behold, the mighty "S"!!! 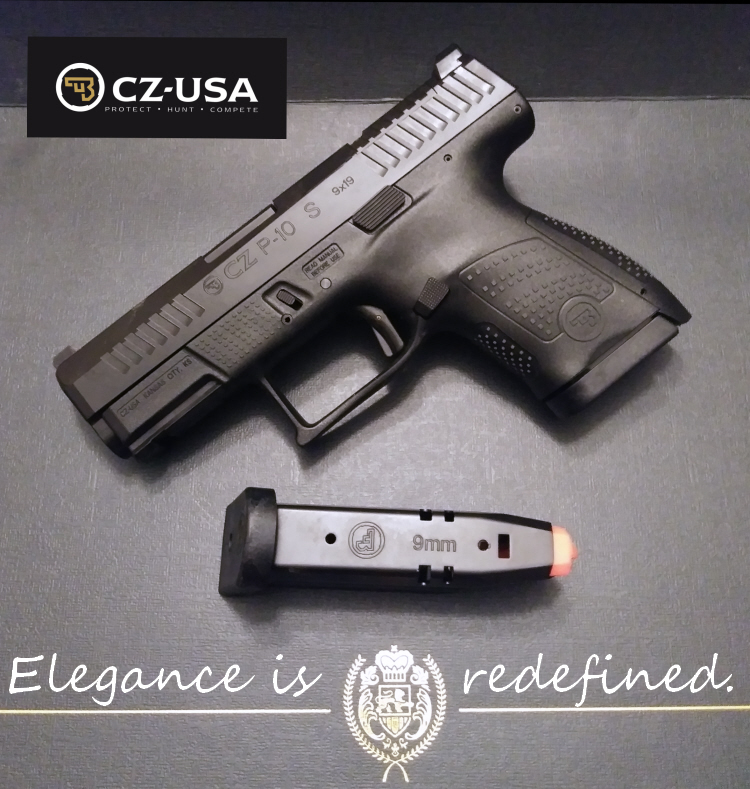 It's a bird, it's a plane, IT'S A CZ!!!! Beautiful! 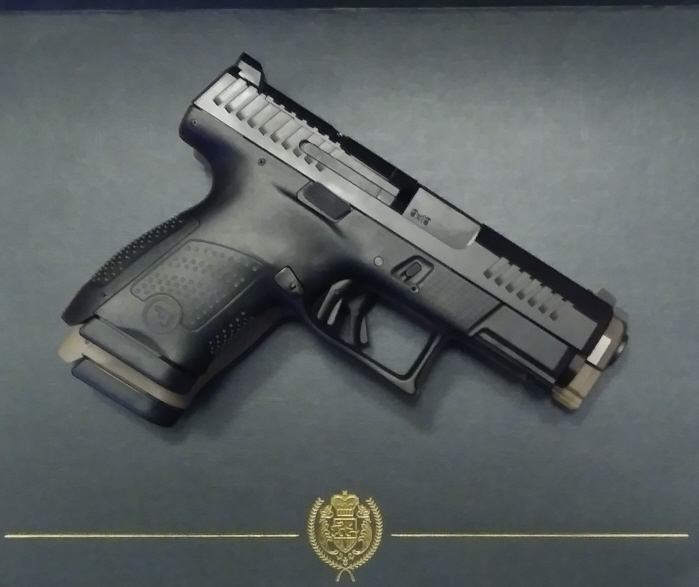 This got me excited again about another CCW. Congrats to your bride! Congrats to Mrs. A! You'll have to get the "honey-do" list done so maybe she'll let you shoot it!! "God Bless The USA" - we need this now more than ever! Re: Behold, the mighty &quot;S&quot;!!! It's a bird, it's a plane, IT'S A CZ!!!! Congrats on the new baby....CZ baby, that is! I’m interested in a range report! Seems closer to the G19 than the P10C. I may have to try to find one. I want to retire my Kahr PM-40 and go to a 9mm carry gun. Only CZ I have is P09. Have Taurus PT111 G2C trying to sell. Was looking at Kimber Shot Show Micro 9(LG) 3in 9mm 7+1 with laser grip & fiber optic. Might change my mind now! It's interesting you say that, because I have a High Noon Slide Guard for a Glock 19, (we are no longer allowed personal holsters at work for training, oh well) and the P-10C does not fit it. Oddly enough, the P-10S does almost fit it, a little bit tight, so it's been baggied up in a damp holster doing some form fitting for a day or so. That way she has a very nice rig for carry when we get the pistol with some rounds down range.